In the variety of challenges encountered in restaurant business, the matter of choosing appropriate table sizes is often overlooked. By studying the choice of table sizes and their relative position directly in term of a generic layout and table mix problem, we find that it plays a key role in the eventual operation of bars and restaurants, enabling up to 29 % reduction of customer refusal in the chosen generic example. Hereby, it is key to install both some rows with larger tables and maintaining a sufficiently large pool of flexible smaller tables. As less distance in between tables is lost, rows of larger tables enable more seating capacity. Smaller tables on the other hand are less compact but can be combined flexibly by customers to fit the arriving party size. In a competitive environment as the bar and restaurant business with other options just around the corner or even next door it is of the utmost importance to maximize the efficiency of the available resources. The restaurant business entails a varied set of interacting operations ranging from inventory planning of highly perishable goods to optimal staff occupation and staff allocation. In this sense, a restaurant constitutes a highly vertical integrated mini factory. As these subtasks are optimized integrally in practical settings, the table size problem is seen as a subpart of the overall revenue management of the restaurant. Several concrete problems such as dynamic pricing, seat allocation and inventory management have received specific attention in literature. As opposed to this, the problem of table sizes was focused on at best indirectly, as an integral part of these other restaurant processes. In search of results that are less bound to specific cases, we study a model that explicitly focuses on the impact of size and relative position of tables on customer service. Specifically, we quantify the average customer refusal due to lack of available tables for a generic example and a variety of system load values. Hereby, we avoid the introduction of any parameter beyond a basic set capturing the customers’ arrivals and service process, similar to a classic queueing model. By doing so we aim to obtain results that, if not quantitatively, at least qualitatively can be applied to a broader set of other restaurants. While the assumption that a host or hostess seats the parties may hold true for many restaurants in the United States, many European restaurants (especially the outdoor seating area) and fast food restaurants all over the world very often use a seat yourself policy. By introducing a wait to be seated policy in the model, the lever of the possible performance improvement is shifted to the host that decides which party is seated at which table at which point. Although this additional control may result in performance improvement, it often yields complicated seating policies that are hard to carry out in practice. Second, the exact seating policy depends on the available table sizes, limiting the possibility to extend the policies and results to other settings. Third, as these policies often breach the FIFO rule, parties likely start complaining when they are being overtaken by other customers. In contrast, our model assumes a seat yourself policy, shifting the lever for performance improvement from the host to the choice of table sizes. By doing so the determining factors for performance improvement are in the hands of the restaurant manager rather than the staff, resulting in more stable improvements which are easier to extend to other settings. Additionally we assume parties that cannot be seated to leave immediately and search an empty table at a neighboring restaurant. This corresponds to a setting where multiple competing restaurants with a seat yourself policy are present in the same neighborhood as for example is the case in a touristic city center. When waiting customers are present both a model for the willingness to join the queue (based on its length) and a patience model for prematurely leaving the queue (based on the time already waiting) are necessary. As both processes are highly dependent on the exact setting of a specific restaurant it would complicate the necessary set of parameters even further. Moreover we expect that a qualitative extension of our conclusions to settings with queues will be possible without modelling this willingness to join or exit the queue. Settings where the willingness of customers to wait is modelled in detail are thus possible but non-vital. Nevertheless they provide an interesting path for extending the current results in future work. We assume customers arrive in parties of two or four. As single customers, just as a party of two, also occupy a table of two opposing seats, we can make an arrival of a party of two represent both single and paired arrivals. Similarly, parties of four may represent both arrivals of three and four persons. And with the addition of a few chairs, parties of five and six often take place at a similar table and may thus be modelled as parties of four. Parties consisting of more than six people are not modelled explicitly. Although some more details are lost by introducing these last two assumptions regarding parties larger than four, they are acceptable as up to 90% of arriving parties are groups of four or less in real life examples. For simplicity's sake, we limit the arrival process to two party sizes (two and four), keeping the complexity of the model low without sacrificing much on the accuracy of the eventual results. Similarly to the queue length simplification, we expect our conclusions to make sense in settings where the party sizes are modelled in more detail. The arrivals are modelled as a Poisson process, i.e. with exponentially distributed interarrival times. Because of the memorylessness of the exponential distribution the expected time until the next arrival is independent of the time expired since the previous arrival. These completely independent arrivals correspond to the case in which different parties do not influence each other's arrival times. The service time, i.e. the time parties spend at the table is modelled as a random variable with a lognormal distribution with a coefficient of variation equal to 1/2, a common assumption in simulation studies of restaurants. In contrast to a normal distribution a lognormal distribution avoids the negative values in a natural way. Moreover the heavy-tailed lognormal distribution is a good reflection of the tendency of some parties to linger their time at the table. We consider five different layouts with varying number of rows, each row consisting of five tables for two. The spacing in between two tables is assumed to be half of the width of a table for two. The tables for two are assumed to be combinable, i.e. if two adjacent tables are unoccupied at the same time they can be combined to seat a party of four. Hereby, adjacent is defined as facing either an edge or a corner of the table concerned. For a table for two completely enclosed by other tables for two this gives a total of eight neighboring tables with which the table is combinable. We assume a table can thus also be combined with adjacent tables on adjacent rows if present and unoccupied. In our layout we also introduce uncombinable tables of four, i.e. tables that have twice the width of a table for two but that cannot be combined with other tables for two or four. As larger tables require less spacing per surface unit, tables of four use the available surface more efficiently. A row of five tables for two with a spacing of half a table for two in between can indeed be replaced with three tables of four with the same (absolute) spacing in between. As a result two additional clients can be seated on a row with an equal length of seven table widths when tables of four are used instead of tables for two. This is shown in the figure below, which compares a single row of tables for two and four. Matching the different table sizes to the party sizes like we do here is a natural choice and is an often analyzed case in other related fields like batch-service queueing systems, where matching the size of parties with the number of customers that can be served at once leads to superior system performance. The capacity increase for tables of four however comes at a cost as the obtained capacity can be used less flexibly. The big advantage of tables for two is their combinability, allowing a perfect fit to the size of the arriving party. If a party of four arrives, two tables for two are combined to a table of four. When the group leaves, the table can be taken apart again to make two tables for two. This is as opposed to a table of four which occasionally is underutilized when a party of two is seated, since in practice, a party of two will not join a table of four already taken by another party of two. Moreover the table of four cannot be taken apart in two tables for two as this would result in a violation of either the fixed spacing in between two tables or the total length of a row. When a party of two arrives we assume they will prefer a table for two. They will thus only occupy a table of four when they see all tables for two occupied. This corresponds to a setting in which a waiter or other employee can ask to switch tables if a couple unnecessarily occupies a table of four. 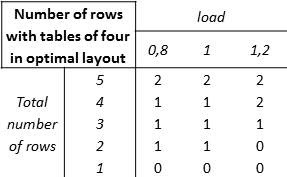 As both a row of tables for two and four have their particular advantage (flexibility and capacity respectively) and disadvantage (more in between spacing and underutilization respectively) it is typically better to combine both in a single layout. This question lies at the heart of the layout and table mix problem, that is investigated for a variety of parameter settings below. By varying the load in different simulations different arrival mixed can be compared. Note that as a consequence of the variability in the arrival process and the service times also for a load smaller than one, parties will sometimes not find an available table and thus will be lost. The average service time E[T] is normalized, i.e. set equal to one. The average interarrival time is thus changed in each simulation to match the chosen load, given the arrival mix and number of rows in the particular layout. In our simulation we vary the total number of rows of tables from one to five. We thus evaluate five different layouts each consisting of rows with five tables for two and rows with three tables of four. In each layout the number of rows that have three tables of four is changed from zero to the number of rows in the layout. The other rows have five tables for two. The load is varied from 0.8 to 1.2 in steps of 0.1, each step yielding five different values. The percentage of customers that arrives as part of a party of four is varied from 0% to 100% in steps of 10%. This amounts to 1100 combinations; for each 106 arrivals are simulated. The most important conclusions of these simulations are summarized below. As we assume that a table for two can be combined with all of its eight unoccupied neighboring tables for two it is important to group the tables for two as much as possible. In order to maximize the combination potential of the tables for two the rows of tables for two are grouped and not alternated with rows with tables of four. When the tables for two can only be combined with tables within the same row, the different rows of tables for two do not have to be grouped. As a first result, it is thus important to note that the dynamics of the combinable tables are an essential boundary condition when determining the optimal layout and should not be neglected. In what follows we keep the assumption that a table for two can be combined with all of its unoccupied neighboring tables for two, up to eight in number, and the rows with tables for two are thus grouped. We first discuss the results of a reference case with a total number of five rows, a load of 0.8 and where 50% of customers arrive as part of a party of four. Note that this corresponds with one in three (33%) parties representing parties of four, the other two thirds accounting for parties of two. When no tables of four are used (the classic layout) we have a capacity of 50 seats (CAP0) and on average 3.96 customers are lost per time unit, the time unit being the average service time. As rows with tables of four are introduced in this layout the capacity increases from 50 with zero rows of tables of four to 60 when all five rows have three tables of four. In the figure below the number of customers lost (or, equivalently, refused) per time unit is shown relative to the number of customers lost when no tables of four are present in the layout (3.96). The same figure shows the capacity relative to the capacity of 50 seats. The x-axis indicates the number of seats used for tables of four divided by the capacity. For example when two out of five rows have tables of four the total capacity equals 54 and approximately 44% of that capacity is provided by the rows with tables of four. It is clear that for each row of tables for two that is replaced with tables of four the capacity of the layout increases. From this figure we can also see that the minimal loss probability in this layout is reached when two out of five rows are replaced with tables of four which results in a layout with a total capacity of 54 seats consisting of six tables of four and 15 tables for two. With this optimal layout, shown in the next figure, the total number of customers lost per time unit decreases with 29% compared to the classic case when no tables of four are present. It is important to note that the points in the graphs are only connected as an illustration. 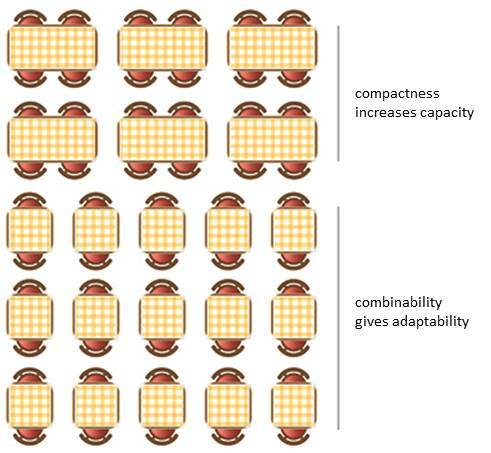 The relation for both the capacity and loss probability when only a part of a row is replaced with tables of four is not linear as the capacity increase only occurs when a complete row is replaced with tables of four. The graph below shows results for almost the same setting, the only difference concerning the arrival mix. The horizontal axis still shows the number of seats used for the tables of four divided by the capacity. The vertical axis displays the number of customers lost per time unit relative to the number of customers that are lost when no tables of four are present (classic layout). Hereby, the latter value varies under the influence of the arrival mix; all values are scaled to 100%. Together with the reference case (33%), the graph displays cases in which 0%, 54% and 100% of parties is a party of four. For the case where all parties are parties of two (0% case) it is clear that using tables of four is of no use. Any table of four introduced is only used by parties of two and thus underutilized. Although rows of tables of four increase the capacity of the layout, this capacity increase cannot compensate for the loss of efficiency due to partial use. If only parties of four arrive, it is clear that it is best to replace all rows with tables for two by rows with tables of four. As no table of four is ever underutilized no loss of efficiency comes along with it. In the case where 54% of parties are parties of four, the layout with only tables for two and the one with only tables of four perform equally well (or badly) in terms of customer loss probability. In that case, any mix of rows with tables for two and four will outperform the case where only a single type of table is present, neatly demonstrating that in general a layout with a single type of tables can be outperformed by an adapted mix of tables. The graph below shows the performance when we consider load values different from that of the reference case. In the considered layout changing two rows to rows with tables of four remains the optimal policy but the available performance improvement decreases with an increased load. As the absolute number of lost customers is higher for an increased load, the improvements in absolute terms are not necessarily lower for higher loads. In the tables below the performance results for all parameters variations are summarized for a fixed arrival mix with 33% of parties consisting of four persons. 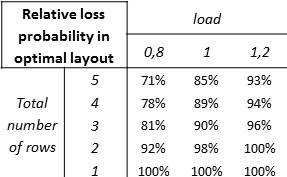 The first table shows the number of rows that need to have tables of four to achieve the lowest possible loss probability for the given setting. The second table shows the optimal performance improvement achieved for this layout compared to the case when only tables for two are present. From these tables it is clear that for smaller layouts with fewer rows, fewer rows have to be equipped with tables of four. For a layout with only one available row for example, it is not advisable to use tables of four at all. In general however it is fair to say that for most layouts it is advisable to change 25% to 50% of the available rows to rows with tables of four. We are convinced that also for other settings, where a more detailed modelling of the party size is appropriate or where customers are willing to queue it is advantageous to have both combinable tables for two and larger fixed size tables in the layout. Simulation results out of the scope of this blogpost (not included) show that even when tables of four do not result in a more efficient use of available space, an optimal mix of the two types of tables still outperforms a layout where only a single type of table is present by several percent, and this for a broad set of parameters. In this blogpost we define the layout and table mix problem and evaluate several design alternatives for restaurants and bars by means of a discrete event simulator and Monte Carlo simulation. Compared to the classic layout in which only combinable smaller tables are used we propose to also use larger tables. As less space in between the larger tables is lost, they enable a higher seating capacity. As the available places of larger tables are used less effectively when a small group takes a large table, a sufficiently large pool of flexible smaller tables remains equally important to optimize the layout. This as smaller tables are less compact but can be combined by customers to fit the arriving party size. 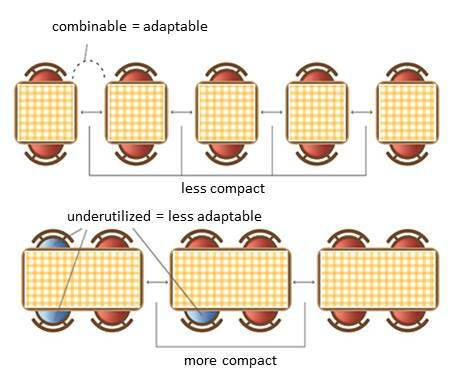 As we assume that a smaller table can be combined with all of its neighboring smaller tables it is thereby important to group the smaller tables as much as possible in order to maximize the possible combinations. By means of a generic example with tables for two and four, we show that for most layouts and parameter settings it is advisable to change 25% to 50% of the available rows to rows with tables of four. By doing so customer loss can be reduced by up to 29% when compared to the classic layout in which only tables for two are present, showing the importance of the layout and table mix problem in restaurant operations. Queues at restrooms are invariably longer for ladies than for men. Time and time again. What are the main causes for this disparity? And how can it be overcome? Moving to unisex toilets, it appears from this study, may reduce waiting times for women from over 6 minutes to less than a minute and a half. Already a symbol for transgender equality, unisex toilets can hence boast excellent figures when it comes to reducing waiting times. Or, how transgender-friendliness may help in battling female-unfriendly toilet culture. No time to read? This 3' animation video summarizes our findings. Kurt Van Hautegem has a bachelor’s degree in Electromechanical Engineering and a master’s degree in Industrial Engineering. Since September 2012 he is PhD. student at the Department of Telecommunications and Information Processing of Ghent University. He currently performs research on mechanisms for buffering and congestion avoidance in all-optical networks. With his background in industrial engineering he is intrigued by mathematical models of seemingly random processes as they occur in day-to-day life. 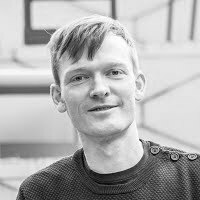 Wouter Rogiest holds a MS degree in electrical engineering and a PhD in engineering. As professor at the Department of Telecommunications and Information Processing, Ghent University, he works on queueing models, i.e. the mathematics of impatience. Applications range from buffer overflows in digital networks and systems to queues of people, cars and shopping carts. 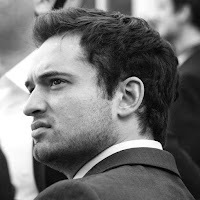 He is also a patent adviser at Brantsandpatents. He is a member of the Advisory Board of Eos Magazine, where he has authored and co-authored (with Kurt) a number of popular-scientific articles (in Dutch), about topics such as being impatient for streaming videos, suffering delay in online games, wasting time in queues at theme parks, being stuck in traffic jams, dehydrating while waiting your turn at a festival bar, not finding a seat on your favorite terrace, and dying to pee.